« Who are the Orishas? The Seven African Powers are a common spiritual force that people petition within Santeria but there is a common misconception around who they are and how they function. If you visit any botanica (spiritual shop) you’ll find candles with something akin to the image on the right claiming to be 7 African Powers Candles. You’ll also find spiritual supplies like baths, oils and powders that claim to work for the Seven African Powers. Who are these powers in reality? 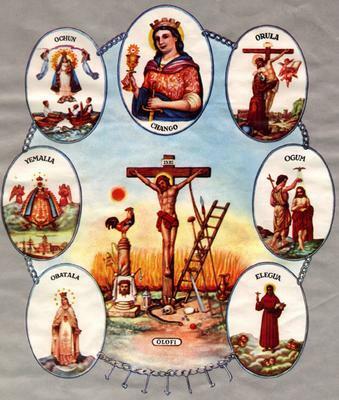 The image to the right shows a collection of seven different saints: Our Lady of Mercy, The Virgin of Regla, Our Lady of Charity of Cobre, Saint Barbara, Saint Joseph of Arimathea, Saint John the Baptist, Saint Martin of Porres (reader-submitted correction: Saint Benito of Palermo), and Jesus on the Cross in the center. Under each saint image is the name of one of the Orishas. The name Olofi is under the image of Jesus. The vignettes of saint images are linked together with a metal chain with 7 of Ogun’s tools hanging from the bottom. Because of the image to the right, most people mistakenly think that the Seven African Powers are the orishas: Elegua, Ogun, Orula, Chango, Oshun, Yemaya and Obatala. But how did this syncretization come about? Who are the Seven African Powers if they aren’t the Orishas? Can anyone work with the Seven African Powers or is it limited to initiates of Santeria only? The syncretization of the Orishas with the individual Catholic saints isn’t that unusual but the grouping of these particular Orishas together is what makes it unique. In order to understand how this portrayal of the Seven African Powers came about, we need to explore another spiritualist tradition called Santerismo. Santerismo developed out of Puerto Rican Espiritismo (Spiritualism) blended with Orisha worship outside of a Lucumí ritual framework. In Santerismo it is common for spiritualist mediums to become possessed by Catholic saints referring to themselves by the names of the Orishas. Santerismo really began to take root in the Puerto Rican community in New York City in the 1950’s shortly after Celina Gonzalez’s song “¡Que Viva Changó!” came out in 1948. The song’s lyrics really display a close syncretization between Saint Barbara and Chango, and the spiritualist community ran with it. Santerismo is NOT Santeria (Lucumí/Lukumi). Santerismo is a spiritualist tradition open to personal revelation while Santeria is an initiatory religion with strict rules. 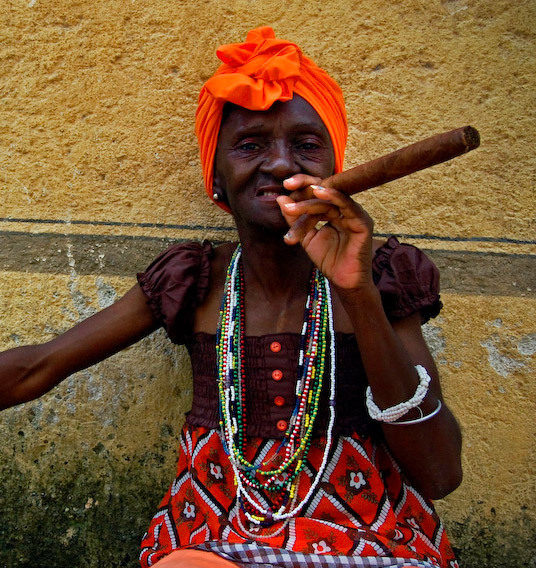 The term “Seven African Powers” is something that exists in Santeria, but they are not the Orishas, they are spirits of the dead – guides – that we’ll discuss a bit later. But the spiritualists in Santerismo didn’t understand the difference and they assumed they were the Orishas themselves. It is also interesting to note that the image of the seven Catholic saints put together in that manner, along with the proliferation of magical supplies dedicated to the Seven African Powers didn’t really come about until the 1970’s and 80’s corresponding with an influx of Latinos into the United States especially from Puerto Rico after a referendum in 1951 officially made Puerto Rico a commonwealth of the U.S. The second generation of Puerto Rican kids was born in the 70’s and 80’s and many of them were born and raised in New York amid the Espiritismo tradition’s influences. The Seven African Powers are actually spirits of the dead from the seven different African tribes that were brought to Cuba and forced into slavery. Within a Santeria (Lucumi/Lukumi) cosmological understanding, the Seven African Powers are araorún (citizens of heaven – dead spirits) – they are not usually Egun (ancestors of blood or initiatory lineage). 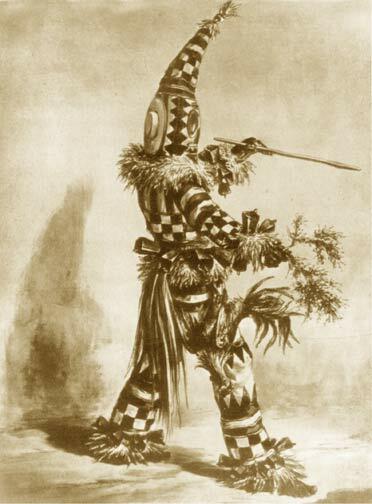 When a person speaks of the Seven African Powers they refer to a group of 7 different spirits, one from each of the following tribes: Yoruba, Congo, Takua, Kissi, Calabari, Arará, and Mandika. A person who has a connection with the Seven African Powers will have one spirit guide from each of these tribes unique to him, and one of the seven will dominate the group and orchestrate their efforts. This is an interesting cultural reflection of the history of Cuba where these seven formerly hostile tribes were forced to live and work together to survive. Within the diloggun oracle’s corpus of information, the Seven African Powers are heavily referenced in the odu Edigbere (7-8). Interestingly, this odu also speaks about the importance of the drum as a tool to call down the Orishas and it also speaks about the power of Congolese magic within the religion of Palo Monte. If a person were to receive the odu 7-8 in a diloggun reading it would indicate that they have the Seven African Powers in their court of spirit guides and it would be up to them to use Spiritualism (Espiritismo) to determine who they are, what their names are and who is the primary one that heads the seven. A strong relationship with that one leading spirit guide allows that person to call upon the support of all seven spirits in any endeavor. The Seven African Powers are called upon for help with spiritual evolution, overcoming obstacles, and cultivation of personal power. Anyone can petition the Seven African Powers as they are spirit guides and everyone, initiated or not, have access to spirits of the dead for their guidance. Typically they are petitioned by lighting vigil candles that are of 7 colors, or using 7 different candles of different colors. It is also traditional to tie strips of cloth or handkerchiefs of seven different colors in a bundle. By whirling this bundle of loose multicolored cloth in the air over your head, as you call the Seven African Powers and petition them for help, you’ll be calling upon the ancestral spirits of these seven tribes to work. This article has cleared up YEARS of misunderstanding. I’m grateful. I just bought this candle last night, but wasn’t sure how I was going to work it. I just knew I needed it 🙂 Thank you. HI MY NAME IS JULIA MERCADO AND MY FATHER IS CHANGO. SOMETIMES ITS HARD WHEN UR STRUGGLING IN LIFE AND WHEN I STRESS I ASK CHANGO FOR GUIDANCE AND IT HELPS ME.I ALSO DREAM WITH HIM AND ALL OF THE OTHER 6 SAINTS ANDI AM BLESSED FOR THIS GIFT THAT I HAVE. Thank you very much for the clear, well-written and insightful explanation of the history and meaning of ‘THE SEVEN AFRICAN POWERS’. I especially appreciate your sense of inclusivity as you explain the ability of anyone, initiate or not, to envoke the aid of this powerful group of African ancestors who well deserve the label THE MAGNIFICENT SEVEN. Chango is my father and the other six walk with me everyday. The Catholic Church doesn’t sanction anything outside of its practice, but the image produced is the effect of the misinformed association of the 7 African Powers with saints through Santerismo in NYC. There will always be a divide between what is sanctioned by the official church and what folk practitioners do. I thank you for the FULL AND ABSOLUTE definition of what the TRUE Seven African Powers are, as what they are used for; I was speaking about this to a friend tonight, and I almost wasn’t sure of the definition; however, I was able to describe it as an assistance in the spirituality world. I promised myself this evening that I was going to surely find the detailed version of what it is. I wrote down the majority of the definition, without even having to copy the whole entire thing; just learning & copying keywords alone was suffice. Alot of folks don’t really understand what spirituality is, and what it’s used for, as well as the full potential of why it exists. I’m glad that this website was able to explain about this subject in full detailed with no holds barred; I am confident that I am able to seek guidance, as well as develop a ‘friendship’ with all of them! Keep up the great work, as I will be visiting this website frequently! Thanks again for the clarification! I wish u had a church in the East Coast. I would love to pray to the saints that you have they are so beautiful.